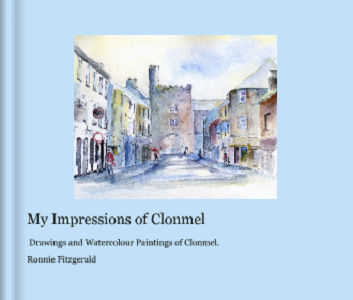 This book is not about the history of the town, neither is it all about the standard images that are associated with Clonmel. It is about my personal impression of the streets and laneways of the town that i have been drawing and painting for the last thirty years. I have also moved a little bit outside the borough for some of the images such as Glenary and some of the Slievenamon paintings, sure I have included some old favourites as well as some new images but it is a very personal journey.